A tooth-supported bridge is a dental restoration that replaces missing teeth. 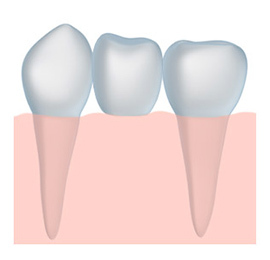 It is made of a false tooth attached to crowns which fit over teeth on both sides of the space. Dental bridges can fix more than one missing tooth and are an excellent solution for patients with gaps in their smile. For patients requiring a dental bridge, we proudly offer this service here in Solana Beach with Dr. Robert Rosenfeld! A dental bridge can fill in gaps left by a missing tooth. They can even be used to fill in more than one gap. Dental bridges look natural and beautiful. A dental bridge feels completely comfortable. Dental bridges are more affordable than some other options. A dental bridge functions like natural teeth. You can maintain it just like your natural teeth. At your first appointment, the two teeth adjacent to the teeth are sculpted for crowns and a provisional bridge is placed. At your second appointment your dental bridge is bonded to the natural teeth. We understand that gaps in a smile can impact your self esteem. There are numerous options available for people missing teeth. To find out more about dental bridges and determine the right option for you, please contact us in Solana Beach.